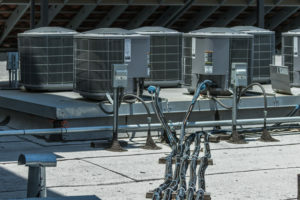 Commercial rooftop HVAC unit installation projects are very complicated and often involve extensive planning. Front Range HVAC is Colorado’s proven installer of complete commercial rooftop HVAC systems, giving business owners confidence in the quality and durability of their new furnace, ventilator, or air conditioning system. Whether your rooftop HVAC unit installation project takes days, weeks, or even months, trust the professionals at Front Range HVAC. We will work diligently to ensure that your expectations are exceeded, all the while respecting your budget and time. Front Range HVAC employs a disciplined, four-step process. By rigorously controlling the quality of the work that is completed during each of these four steps, we’re able to deliver a simply better rooftop unit installation. Evaluate the existing structure to determine what preparation work is required before the installation of the new rooftop unit. Even though this step doesn’t take very long to complete, it still must be done with meticulous attention to detail. Front Range HVAC will make sure you’re updated on any potential issues that we uncover along the way. The HVAC unit is ordered, and the project timeline begins. We work directly with the commercial HVAC unit manufacturer to arrange delivery of all the equipment needed for the job. When this happens, a Front Range HVAC representative will keep you aware of our next steps, so there are no surprises. As the rooftop unit installation progresses, we control for quality at every turn. Inferior HVAC contracting companies presume that their work quality is acceptable. We physically check that it is, holding ourselves accountable for every detail. After installation, we remain available to address any other concerns. If you’re not 100% satisfied with the quality of your commercial rooftop unit installation, we’ll do everything in our power to make it right. We do this because we know that if your commercial furnace, ventilator, or air conditioner installation project isn’t successful, we won’t be successful. We believe that our proprietary, four-step process combined with our expertly trained technicians set us apart as Colorado’s premier provider of commercial HVAC unit installation solutions. At Front Range HVAC, we know that every project is unique. To account for this, we take a consultative approach to every new commercial HVAC unit installation project we take on. We want the chance to show you why we’ve become the go-to resource for new commercial HVAC units. When you’re ready to talk about your HVAC unit installation project, give us a call at (303) 942-1372.